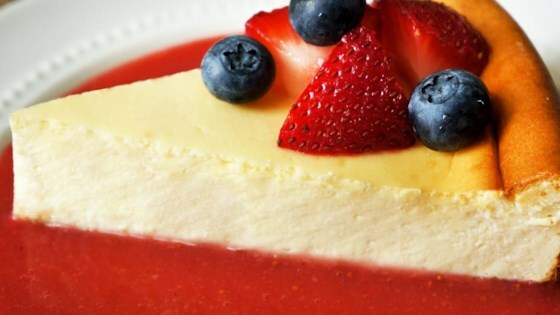 See how to make sensational cheesecake the New York way. Chef John serves this with his Fresh Strawberry Sauce. One of the best I have made or tasted. A real family hit! The only change made was I made my graham cracker crust a bit different, but all in all followed the receipe and it turned out perfect. This is the tastiest cheese cake in Sweden! Made this over the weekend and did a mixture of half cream cheese half quark. Soooo delicious! This is an amazing recipe. It came out perfectly and is the best cheesecake I have ever tasted, and that's including any cheesecakes ever purchased in bakeries.